Mid 18th century, with 19th century addition. 2 storey and attic, 5-bay classical coaching inn, with 5 lower recessed bays adjoined to right. Rendered and whitewashed, with polished ashlar margins and stop-chamfered arrises. Base course; corniced fascia band course between principal and 1st floors; cornice and blocking course with central wallhead tablet at 1st floor to original inn at left. ORIGINAL INN: pilastered doorpiece with corniced lintel, centred at ground, comprising timber door with plate glass rectangular fanlight; regular fenestration to remaining bays at ground, with further pilasters flanking outer bays, regular fenestration at 1st floor. 5-BAY ADDITION: recessed to right, comprising 2-leaf, 4-panel timber door with plate glass rectangular fanlight in bay to outer right at ground; regular fenestration to remaining bays at ground, and in bays at 1st floor. Single storey coped infill to re-entrant angle. W ELEVATION: 2-bay gable, with windows to outer left and right at ground and 1st floor. N ELEVATION: partly-obscured by later single storey addition centred at ground, with coped segmental-arched pedimented doorpiece in re-entrant angle to W. Irregular fenestration. E ELEVATION: blank gable, with roof swept-down to N, remains of former walls rising to 1st floor, to street, and to right of centre. Predominantly 4-pane timber sash and case windows. Grey slate roofs, with lead ridges. 3 regularly-spaced slate-hung rectangular piended dormers. Cast-iron rainwater goods. Gablehead stacks and shouldered wallhead stack; coped, with circular cans. Coped skews. 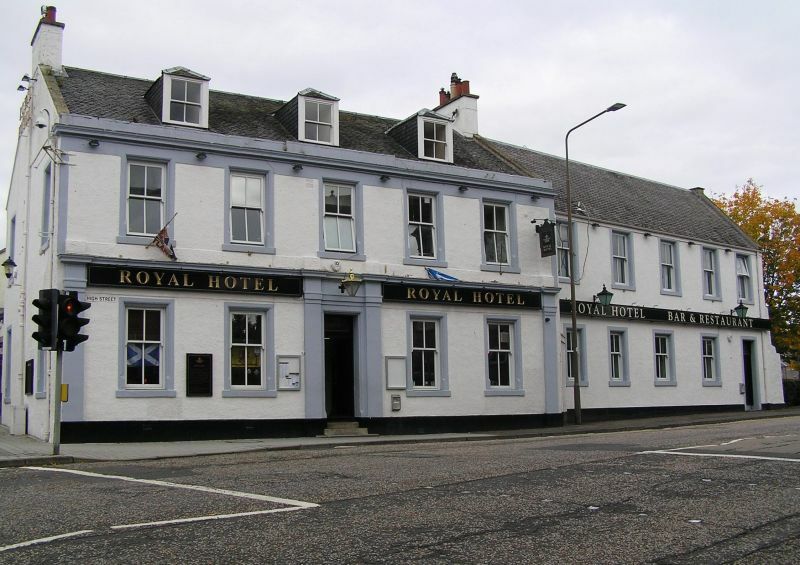 The Royal Hotel is of interest as a good former coaching inn, with some detail survival, on a strategic site on the southern approach road into Edinburgh.